That was Paul’s concern as he wrote these chapters in Romans. It appears that the Christians in Rome did not get along very well. As the capital city of the empire, it was home to people from all over. Some were Roman, either by birth or by citizenship, and had adopted the customs and practices of “good” Roman people. Historians now call these people Hellenists. They spoke Latin or Greek, or both, and saw the world through the prism of the great civilizations of Greece and Rome. There were also Hebrew people in the capital city. Though they were far from the worship practices of the temple in Jerusalem, they practiced their faith and culture with conviction. These diaspora people, or those scattered from their homeland, saw their religious customs as key to their identity, just as the Romans did their own culture. For the early Christian community of Rome, these two cultural systems seem to have been a significant source of conflict. Much of Paul’s letter deals specifically with the conflict of law, religion, and culture that quickly emerged between Hellenist and Hebrew followers of Jesus. This letter, one that scholars and theologians call his most eloquent and succinct articulation of the gospel, was written to bring these to cultural groups together. Paul’s critique, however, came with an instruction. “Let us then pursue what makes for peace and for mutual edification” (Romans 14:19, NRSV). We might be tempted to emphasize Paul’s exhortation to peace in the church, but that would miss the qualifying clause at the end. Peace is not the end, in and of itself. Rather, the peace within the church is so that all believers might be edified and grow in their faith. Setting aside religious practices is not a decision to be made lightly. Rather, Paul’s admonition was for the church to emphasize two things—their shared faith in Christ and their need to build each other up in the faith. If the pious practices were sowing discord, they were also undermining the each one’s discipleship to Jesus. For us good Pietists, Paul’s words to the Roman church are a clear challenge. While we deeply value the practices of our faith we must continue to examine our motivations and the impact on fellow believers. Peace, in this regard, is a characteristic of our community and our practices. When our practices sow discord and conflict, Paul warns us, we are not true Pietists. May our practices and changes of practice, both rooted in our faith, lead us to be United: Pursuing peace together. Find a full order of service for the 2018 Mission Offering (suggested date Sept. 16) at www.brethren.org/missionoffering or support the Church of the Brethren today at www.brethren.org/give. “Only, live your life in a manner worthy of the gospel of Christ, so that, whether I come and see you or am absent and hear about you, I will know that you are standing firm in one spirit, striving side by side with one mind for the faith of the gospel” (Philippians 1:27). 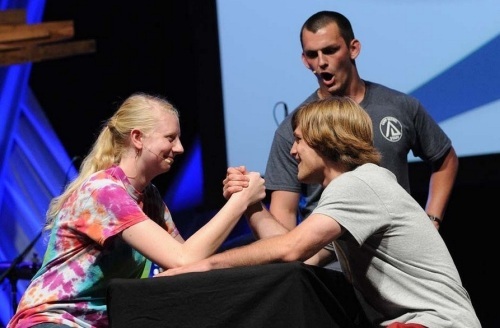 The Apostle Paul was obsessed with unity. Ever since his perspective was changed from “the Jews are the chosen people” to “all people are welcome in God’s family,” he was compelled to bring all people to the table of Christian fellowship. It doesn’t require much effort to find the motivation of Paul’s passion for Christian community. Jesus, too, was all about sticking together in God’s family. Before Jesus was arrested, he prayed for his disciples and for us (those who would believe because of their message): “that they may be one” (John 17:21). The unity that Jes us experienced with God the Creator and the Holy Spirit was the same unity he prayed over his disciples and all who would follow them. With the inspiration of Jesus, Paul’s obsession seems well founded and worthy of continuing. In his letter to the Philippians, we hear Paul at it again. With the declared hope that th e believers at Philippi would be of one mind, we hear echoes of Paul’s words to the church in Ephesus, “There is one body and one Spirit, just as you were called to the one hope of your calling, one Lord, one faith, one baptism, one God and Father of all, who is above all and through all and in all” (Ephesians 4:4-6). Signs of God’s love include living at peace with all sisters and brothers, and striving to be of one mind and mission. With his words, Paul paints beautiful pictures of what it looks like for the church to be faithful in loving God and loving others. 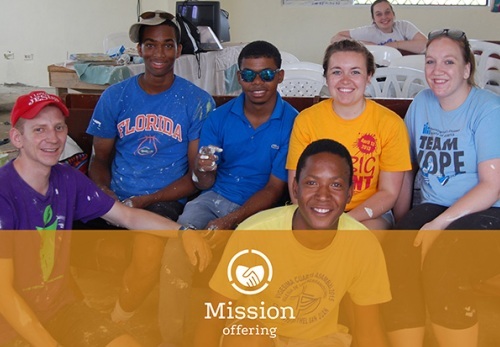 The Mission Offering highlights the international partners of the Church of the Brethren. As we partner with our sisters and brothers in places like Brazil, the Dominican Republic, Haiti, Nigeria, and South Sudan, there is much opportunity for mutual encouragement and strengthening of faith. Though how we minister within communities may look rather different, God’s call to all is share the love and hope of Jesus in all places. As we walk with our sisters and brothers around the world, the words of Paul to the Philippians can still guide us today. Whether we are gathered together or far apart, the evidence of God’s love will be known through the unity we share. Though we may be nations and even oceans apart, we share an unbreakable bond within God’s family. Being held together by God’s love and caught up with what the Holy Spirit is doing, we can persevere and stand together in faith. Find a full order of service for the 2016 Mission Offering (suggested date Sept. 18) at www.brethren.org/missionoffering or support the Church of the Brethren today at www.brethren.org/give . 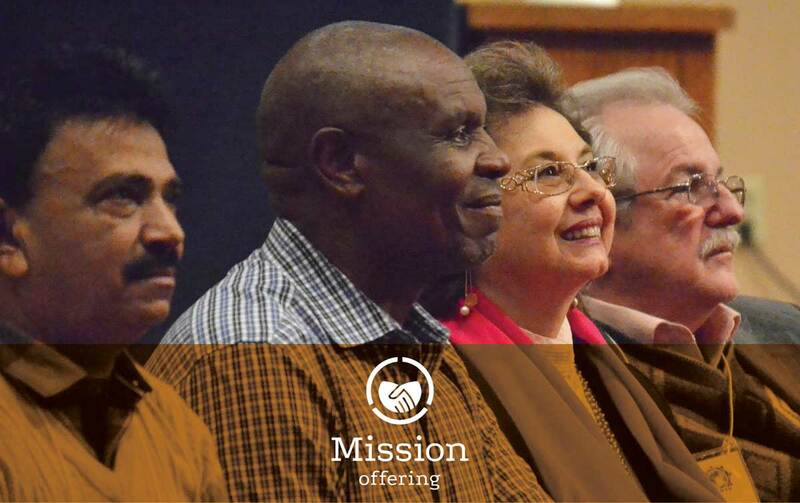 Find worship resources for this year’s Mission Offering at www.brethren.org/missionoffering . A theme interpretation written for the 2015 Mission Offering. Amidst the busyness of life, it’s important to stay focused. Hardships, responsibilities, opportunities, short-comings, and “nay sayers” can all take our attention away from what is most important. Challenges and obstacles are also a regular part of life for our partners around the globe. Facing daily persecution, violence, and limitations, their efforts to show love to God and neighbor is challenged regularly. Whether completing a project or staying dedicated to a mission, being faithful to what God has called us requires perseverance. Staying focused in ministry has been a challenge since the very beginning of the church. In Paul’s words to the Philippians, he acknowledged their disappointments and wounds. Having experienced many challenges himself, Paul understood what it meant to come up short of a goal. However, while sitting in jail, Paul recognized the Philippians as a precious gift. In spite of the hardships experienced by Paul and the church of Philippi, Paul reminded them of what is most important: “that Christ is proclaimed in every way” (1:18). Despite the persecutions they had encountered, Paul reminded them not to worry about people and factors beyond their control. The declaration and power of the gospel is not hindered by the short-coming of humanity. We can choose to obsess about the vain preachers or the peddlers of prosperity, or we can choose to celebrate the places where Jesus is proclaimed in word and action. God alone is able and worthy to judge the minds and hearts of each person. As the body of Christ, our first responsibility is to celebrate in the proclamation of Jesus’ name. The ministry of Jesus and power of God in the world is not dampened by our failures either. If we ever lose focus or stumble, God’s love and grace remain present. If the good news of Jesus is proclaimed in our words and actions, there is reason for celebration through any season. While it may seem that our own limitations or external challenges prevent us from celebrating the work of God, we can find comfort and joy each day if the name of Jesus is proclaimed. It is in witnessing this proclamation in every way that we have reason to rejoice in Christ. Written by Matt DeBall, coordinator of Donor Communications. Find a full order of service written by Ken Gibble for the 2015 Mission Offering (suggested date Sept. 20) at www.brethren.org/missionoffering or support the Church of the Brethren today at www.brethren.org/give .